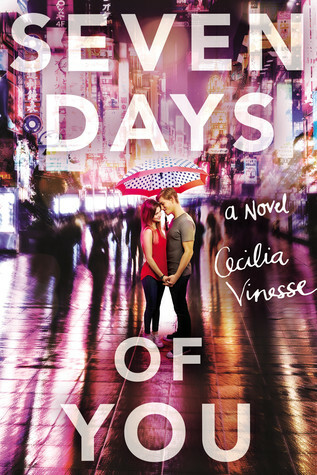 As soon as I found out that Seven Days of You was set in Tokyo, I was sold. There are hardly any YA contemporary books (at least ones I’ve heard of) that take place outside of the United States and Europe, so I was beyond excited for this book. Sophia has a week left before she moves away from the city that has been her home more than anywhere else in the world: Tokyo. As she tries to prepare to leave and say goodbye to her best friends, the one boy she never wants to see again moves back to Japan and messes everything up for her. I absolutely loved the setting. Everything about it screamed the author’s love for Tokyo/Japan, and I felt like I was right there in the busy city, even though I have never been there before. I have always wanted to visit Tokyo (and other parts of Japan as well) so I really enjoyed this little peak into the city from Sophia’s eyes. Even though I enjoyed the setting so much, I was disappointed by Sophia’s lack of knowledge of the Japanese language. After living in Tokyo for four years, I expected her to be able to speak the language better. I really loved the concept of Sophia leaving the week Jamie was arrives, and them then proceeding to have feelings for each other. What a cruel twist of fate! Due to the nature of this plot, the relationship is very much an insta-love one, but that is of course expected so it works. I loved that Jamie was there for Sophie as she struggled with the other relationships in her life and how they were able to work out the problems of their past. Spoiler alert: I also really appreciated how realistic the ending was and how two teenagers didn’t try to pretend they could make a long-distance, across-the-world relationship work. Overall, Seven Days of You is an enjoyable contemporary book that I flew through. I think younger teens will love this book!